Hello, all! I hope you all had a wonderful weekend! Mine wasn’t so great, but I’m not going into that. This week is going to be full of flashback manis. The reason? I’ll be doing my Literary Lacquer swatching! I’m not one of those swatchers that can pump out a whole collection in one day. Between the hand posing, nail art and editing, all the little things add up to back pain. So, I space my swatching to avoid the problem. Onto the flashback! I did this mani as a press sample because Born Pretty sent me this teal stamping polish to try. I have to say- it’s simple, but one of my favorites that I’ve done! I fell in love with this neon color. I’m not sure if it’s still available at Five Below or not. You’d have to actually go to the store and see. Plus these and Funky Fingers are 3 for $5 and you can’t go wrong at that price! You’re bound to find something you like. So for this, I did 2 coats of I Haz Matte (no white undies) and the formula was superb. When it was dry, I stamped it with the teal stamping polish I got at Born Pretty. If you’re interested in this or other BP stamping polishes, you can use my code LESLIEW10 for 10% off of your order. This polish was item #27283. The plate I used is also Born Pretty- BPL-027. I hope you guys like this and don’t mind a week of flashbacks! Super cute! I love bps stamping polish. I love these paired together! Whoa the stamping is so crisp! This stamping is perfection! It reminds me of Keith Haring designs. Beautiful stamp. 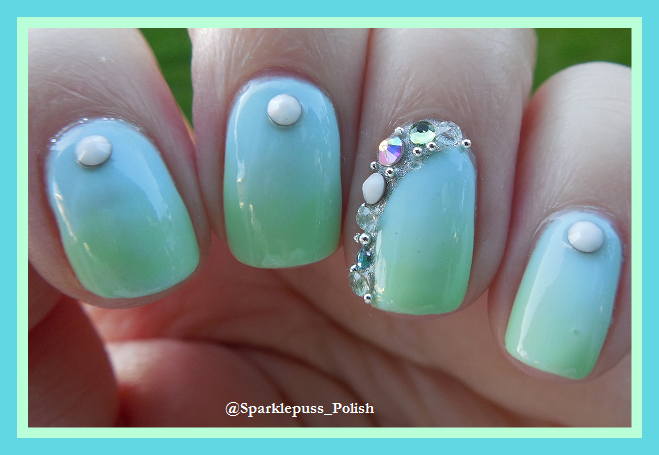 Those two polishes are lovely together.